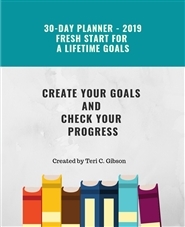 30-Day Planner for 2019. This is created to use with Life Coaching programs for 30-day programs or for short personal goals. It takes 21 days to form a new habit. Create your goals and then document your progress. Stay on course for 21 days and you have started your transformation. By documenting your goals and charting your progress, aids in changing your mindset. This is great for those who need a tool to get organized and you find that writing has helped you in the past. This is a product of Gibson Skill Development and Training Center LLC.